In the months leading up to 2015’s Fall marathons, RunWashington is following several local runners as they prepare for their races. We’ll chart their progress as they train their legs, lungs and minds for the challenges they’ll race on race day. Each week, we’ll catch up with our runners and see how they’re doing. This is the fourth story about Will Etti, read the first, second and third. Will Etti is ready to tackle the Marine Corps Marathon once again, and this time, he thinks he’s ready for it. Since this year’s iconic DC race falls on Will Etti’s 39th birthday, he’s chosen it from the two options he was considering. Etti was registered for both the Baltimore Marathon and the Marine Corps Marathon, but he opted to defer Baltimore until next year. Though he wants to run Baltimore in tribute to his lifelong Maryland residency, he’s looking for redemption in D.C. first. “I’m using my experience from last year as a gauge for this year,” Etti said. He’s planning to use the Cliff Bar pacing team to hit his time goal of a sub-5:00 marathon. “Even if I feel like I can run faster, I’m going to stay with the pacer,” Etti said. Last year, Etti trained for the Marine Corps Marathon, and made a lot of first timer mistakes. He felt good, went out too fast, and got hit with cramping that dogged his last ten miles. What’s different about this year? Everything. He has trained differently, incorporated a strength and flexibility routine, and has been experimenting with fuel and hydration with each long run, making sure he knows what works best for him. “I always think that you always learn from your previous marathon experiences. Will [Etti] being relatively new to marathoning is still learning,” said Conroy Zien, director the First Time Marathoners (FTM)program in which Etti participates. A self-described nerd when it comes to running, Etti is constantly looking for ways to improve his performance and avoid previous pitfalls. He takes a systematic approach towards incorporating new training elements and discarding ones that don’t serve him well. “It seems like he’s found a formula that is going to work for him,” Zien said, noting that Will has practiced with different nutrition and hydration combinations throughout his training. If Zien could give a list of 10 things for people to remember when they’re running a marathon, “the first five would be: don’t go out too fast,” Zien said. Etti knows that played a big part in his last marathon effort. The former track athlete knows how to push himself. This time around, he’s worked on pulling himself back. He dropped back to a slower pace group early on in training and feels good about it. “I have really high hopes that he’s going to break five hours. I think he’s focused enough to not fall victim to race day euphoria,” Zien said. Etti’s track background helps him out a lot when it comes to speed work. He is acquainted with the pain of pushing himself to the limit. He encourages his teammates through track workouts, reminding them that this is what they’re going to feel like on race day. “The track background is definitely there, you have muscle memory. I know I can push, because I’m trained to push. I always remember when I was in high school, running the mile, and I was ready to move, and my coach kept yelling at me to be patient. Then, in the third lap he was yelling at me to make your move, make your move. So I still hear that,” Etti said. He went on to say that the time to ratchet things up in the half marathon is at about mile 11. For the marathon? He doesn’t know…yet. Etti certainly feels better prepared going into this year’s marathon. He has been focused on building strength and flexibility with a cross training schedule that includes a day of yoga and a day of body pump. He also does stretching and foam rolling every week in preparation for long runs. He has not been dogged by the ITBS that caused him a painful half marathon last year. He incorporated what he learned coming back from that to stay injury free this year. “The PT made me much more self-aware of my form – when I get tired I tend to lean back, which is easier on the back, but tough on the pelvic area, so I remind myself,” Etti said. He’s added tempo runs to his mid-week runs, and has already seen himself able to maintain a faster pace for longer periods of time. He felt it pay off in his recent performance at the Parks Half Marathon. Etti thinks that if he manages to hold himself back in the beginning and take in the right ratios of hydration, salt, and nutrition along the way, he’s going to be able to stick with the pace group and meet his goal of a sub five hour marathon. “When something doesn’t go the way you expected to, if you come back a little angry, it can be a good thing. I think that’s the attitude Will took – he’s had a very constructive view of himself on what he did wrong last year and work on it,” Zien said. 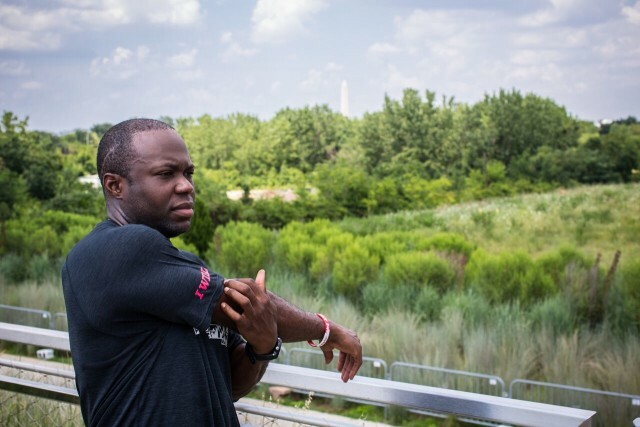 Etti has channeled his desire to prove himself on the Marine Corps Marathon course into actionable steps throughout his training. Redemption is a lifelong theme for Etti. Raised in a rough neighborhood, Will’s path out started with running. The discipline it gave him as well as the opportunity to see a world outside of his immediate area inspired him to pursue a different route than many of his peers. After a serious car accident nearly paralyzed him, he decided to go for his goal of an advanced degree. Now a PhD candidate nearing the completion of his coursework, Etti gives presentations at national conferences. Through it all, running remains Will’s path forward. He uses his time running to order and reflect on his life. Running the Marine Corps Marathon for Etti is a way to mark the progress he’s made, to honor the way his family, work, and academic life are manifesting positively. It’s also a chance to look back and remember where he came from. He is running the race as a celebration of his life now, and also as a commemoration of a life lost. He’s dedicating his race to the memory of his sister, Sherri Etti, who, had she not passed in 1993 due to pregnancy labor complications would be celebrating her 45th birthday this year on Oct. 30. After adding the Marine Corps marathon to his list of successes, Etti will be coaching with FTM’s 10:20 pace group this winter, sharing his upbeat attitude and his love of learning about his sport with others.